I think it’s important that I stress that what works for myself may not work for you. In fact, the things I’ve decided did not help me might be exactly what makes a positive difference for you. Everyone is different. Sometimes tightening the mask works for one person while others need to leave it loose. Some individuals will have fewer events when sleeping on their sides and others have fewer events on their backs. There are very few suggestions that work for everyone. A perfect example can be found in comparing what works for myself to things that work for my wife, who was recently diagnosed with OSA. This page is about my experience with using a Continuous Positive Airway Pressure (CPAP) machine to treat obstructive sleep apnea (there are other types of sleep apnea but this is the kind that I was diagnosed with). I’d like to emphasize that this is only my experience. Not everyone will encounter the same problems or prefer similar solutions. Many suffers may experience far less or far more issues. The severity of a person’s sleep apnea is also a factor. Coping with sleep apnea is often a balancing act between treatment effectiveness and comfort. It’s not unusual for patients to become non-compliant, a term for not using a CPAP machine or at least not using it effectively. I’m only guessing but the most common reason for non-compliance is probably discomfort. If you’re new to using a CPAP it’s important to understand that adjusting to the mask and breathing against the pressure (depending on the machine and mask) will probably not happen over night. It can take weeks or months and sometimes even longer but if you can get through the hard part it can be worth the effort. Eventually, you may find that even the worst of your nights aren’t as bad as they were without treatment. Another important thing to realize is that you’re not alone. Sure, you may have just been diagnosed with sleep apnea and never even heard of it before or maybe you didn’t know what a CPAP is. But that doesn’t mean that you don’t know someone that uses one. In addition, there are numerous resources online where you can find advice or, if you’re more social, communicate with fellow CPAP users. One resource I’ve used on numerous occasions is cpaptalk.com (CPAP and Sleep Apnea Community). Sleep apnea can cause many problems. The most significant symptom I’ve experienced is extreme fatigue. Fatigue can also cause several other symptoms such as trouble remembering or difficulty concentrating. Depression can even be a result, though I was usually just depressed because I didn’t have the energy to do anything. I’ve had days when I felt emotionally off-balance, almost on the edge of a kind of paranoia in the sense that small things I wouldn’t normally worry about really stressed me. But being aware of this can make dealing with the “bad days” much easier. I’ve always been able to relax once I recognized that things weren’t really very bad – I just didn’t sleep well. Many will find that it’s not a simple task of putting on a CPAP mask and waking up every morning feeling great. Some of you will. I suggest that you don’t give up. Not only because you’ll feel better but, from what I’ve read and been told by my doctors, untreated sleep apnea can lead to more severe problems. In any case, good luck and I hope that you will find this information helpful. I was diagnosed with Obstructive Sleep Apnea several years ago, probably around 2005. I suspect it began at least 10 years prior but it didn’t become severe until around the time I was diagnosed. I suddenly noticed that I was feeling very exhausted, it was impacting my efficiency at work, and when I visited my doctor I described it as feeling “drugged” for no apparent reason (at the time I thought I was getting a full night’s rest). I went through a few sleep studies before I was diagnosed and then prescribed a CPAP machine. The first six months were the most difficult. Even over the first few years it wasn’t uncommon for me to wake up and discover that I had removed the mask in the middle of the night and it wasn’t unusual to experience nights in which my treatment didn’t work for one reason or another. Almost two years ago I revisited my sleep doctor ahead of schedule and complained that I was experiencing symptoms similar to those I experienced prior to being diagnosed. He performed another sleep study. My symptoms weren’t much different but I had done some research on my own and asked about an auto-titration machine, which is what I now have and it’s been a significant improvement to the point that I’m fully compliant with CPAP treatment and get anxious at the thought of sleeping even one night without it (anxious because I know how bad I’ll feel if I don’t use it). I’ve dealt with several different problems over the years and thought I’d provide a little bit of information that other CPAP users might find useful. Based on speaking with other folks that have been diagnosed with Obstructive Sleep Apnea I suspect it’s very common for individuals to not stick with the treatment. I think much of the non-compliance stems from comfort issues, which can directly affect the effectiveness of the treatment. Only recently have I felt like I’ve truly resolved most of the problems I had with my CPAP treatment. 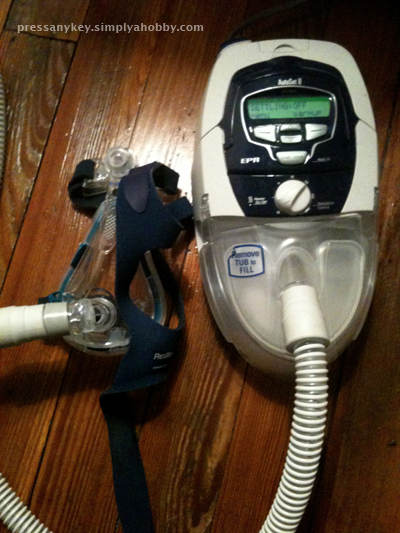 My first machine was a ResMed S8 Elite with humidifier. I used an Ultra Mirage Full Face mask. This worked well and much better than going without treatment but I suspect I had a number of mask leaks that I wasn’t aware of, among other issues. The Ultra Mirage mask was prone to breaking, especially when I took it off at night and dropped it to the floor. I probably ordered the same replacement part for the mask at least eight times while I was using the machine (it was usually the bridge at the top where one could adjust the angle of the top part of the mask). My current machine is a ResMed S8 Autoset II. It is a world of a difference and much quieter as well. In fact, my wife had become so accustomed to the level of white-noise generated by the first machine that we now have an air filter running at night to make up for the difference. Note that this type of device is often referred to as an APAP, which stands for Automatic Positive Airway Pressure. I can’t seem to find the link but another individual had posted a page describing how “automatic CPAP” is probably a better name than APAP, which I agree with. So, an APAP device is just a CPAP that is capable of automatically adjusting the air pressure when it detects that the current air pressure isn’t enough to assist in opening the airways. What’s the benefit of an APAP versus a CPAP? Well, initially, when I was using a CPAP device my pressure was set at around 5 or 6 (static – not a range). This was somewhat effective but still resulted in fatigue and many bad days. A couple of years ago, when I went back for another sleep study I requested an APAP. The pressure range on the new machine was set to work from 5 up to 15 and it’s made a significant difference. I’ve started monitoring my pressure, leak rate, AHI, AI, and HI and I’ve recently learned that the system is usually providing air pressure between 9 and 11 (sometimes slightly higher). If this is what I actually needed back when I used the CPAP (S8 Elite) it certainly explains why the first few years of treatment were so difficult, considering it wasn’t set any higher than 6. I admit to tinkering with my pressure settings back then… but I usually reverted the settings when I concluded that it didn’t make a difference. The main reason was that I wasn’t aware my required pressure was that high. I rarely changed the pressure to go above 8. Recently, I went ahead and adjusted my minimum pressure setting, based on CPAP statistics. I noted that overall the machine usually provided pressure at 9 or above, so I bumped the minimum from 5 up to 9. Again, I wouldn’t recommend that anyone do this on a whim, especially if your CPAP compliance is being monitored. I’ve since made some additional adjustments to my pressure settings. My first machine and my current machine both have humidifiers. After my last sleep study it was suggested that I use it every night but I often forget. Only distilled water is recommended, but I’ve used tap water many times. Distilled water is best because it won’t leave any calcium or other deposits behind, which can make it more difficult to clean the humidifier. I’ve found that the best way to stay compliant with humidifier use is to simply stock up on several gallons of distilled water. The main reason I stop using it is simply because I run out of distilled water and forget to buy more. There will be situations in which using the humidifier isn’t practical. For example, the battery I purchased for powering the CPAP when camping (or in an emergency) is not capable of operating the humidifier. I used to leave the humidifier at home when traveling (even when staying in a hotel) but now I always take it with me and it’s very rare that I do not use the humidifier now. When filling the humidifier pay attention to the fill line. Overfilling can cause water to be blown into the hose. My fill line for the S8 humidifier seems to be correct. However, we’ve noticed that we can’t fill the humidifier that came with my wife’s S9 to the max line. If we do that then it always blows water into the hose. Instead, it needs to be filled closer to the second line from the top of the gauge. The ResMed Mirage Quattro Full Face Mask has a construction that seems much more resilient than the older ResMed Ultra Mirage Full Face Mask, which was prone to breaking. Of course, I also stopped taking the mask off at night so it didn’t suffer the same beating, but I think the mask construction itself was much better. I tried using a Fisher & Paykel Forma Full Face Mask but I did not find it as effective as the Mirage Quattro. My stats often appeared slightly better, but the leak alarm went off more times in a week then it did when using the Quattro for an entire year. It seemed to be effective only when I slept on my side and that was a problem since I often rolled over to sleep on my back. I decided to take it back within the 30-day try-out period and exchange it for another Mirage Quattro that I kept as a spare. With the Mirage Quattro I had a very difficult time getting my AHI down to 3 or below, though my AI was usually good (around 0.5-0.3 on average). In addition, the quality of sleep wasn’t very consistent. At one point I switched to a ResMed Quattro FX and my sleep had improved considerably and I had fewer bad nights, as long as my headgear and cushion were relatively new. I started using a nasal pillow mask instead (RespCare Aloha Nasal Pillow Mask), going in a completely different direction. Ensuring the mask seal is in good condition is critical. An aging mask seal will become less rigid and eventually allow small air leaks that may not be noticed at night. I’ve read that this part should be replaced about every 3 months. I didn’t always replace it that often – it added up quickly considering the part costs an average of $54. In addition, I used Lansinoh (Lanolin Oil) to create a more effective seal. It’s a tacky substance that helps seal small leaks and also create a better seal between one’s face and a silicone mask seal. I’m still using a little bit with the nasal pillow mask. The mask straps have always been an issue. The edge of the velcro had a tendency to scratch my neck over the course of the night. I’ve used some strap covers off and on that sometimes seem to help, depending on the mask/headgear. 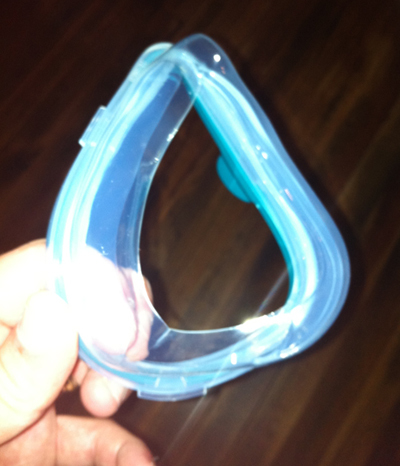 The new nasal pillow mask I’ve started using has something like this built into the side straps. CPAP machines usually have air filters that need to be replaced. I don’t just replace them on a specific frequency – I usually remove a filter, inspect it, and if it doesn’t look very dirty I continue using it for a while. I’m bad about cleaning my CPAP equipment on a regular basis. Honestly, I probably clean out the hose and mask by soaking them in vinegar only about once every few months. I have started cleaning the mask a little more frequently using some mask wipes. I’ve been told that the CPAP mask should be replaced at least once a year. However, considering they often cost between $150-$200, and as far as I know it’s only “free” under my health care plan if I have money available for reimbursement, I rarely purchase a new mask. 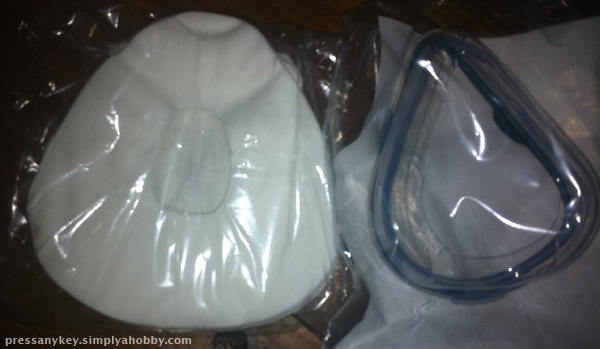 Most of the parts are solid plastic and though they can wear out it’s been my experience that I only need to replace the gel parts on a regular basis; typically the mask cushion. This is somewhat controversial and I’m not entirely certain what the correct answer for every situation will be. Some feel that we should be able to change the settings. Others think it’s illegal. I think the correct answer is that it’s not illegal but in most situations it is best to have the sleep doctor or the provider of the machine change the settings or at least for them to know in advance. I admit that in the past I have changed my own pressure setting and that it didn’t really help (though one could argue that if I had known that 11 was closer to my required pressure then I might not have needed the APAP). Setting your air pressure too low or too high can result in significant complications, at the least. In general, I do not advocate changing your settings without first notifying your doctor – contact your sleep doctor if something’s wrong with the treatment (it might be an issue unrelated to the machine pressure). I rarely mess with the operational settings of the device itself. However, I do go into the Clinical Menu to access the statistics. From there I can view the calculated pressure, leak rate, AHI, etc. I use that information to determine how well I’m sleeping/breathing and whether or not there are any problems to address. On both of these ResMed machines its very easy to access the menu but due to the uncertainty surrounding this topic suggest that you search Google if you really want to know how to access these areas. The only significant setting I changed on my new machine, which I should have probably asked to have set, was the “high leak” alert that will sound if there’s a significant leak around my mask or in the tubing. Note that you may create a conflict with your sleep doctor and possibly your insurance company by changing your CPAP settings, especially if your machine is capable of “phoning home” to report compliance/usage data or if you take it in to have the data read. In fact, it seems less likely that you’ll want to do this with newer machines, especially as insurance requirements change. My wife was recently diagnosed with OSA as well. When we went to pickup her CPAP, and new S9 model, they made it clear that they plan to monitor her compliance for the insurance company. The insurance company now requires proof that the machine is being used for at least 4 hours per night (I think there’s also an alternative percentage such as 75% of the night). They had planned to connect a wireless modem (I’m assuming it connects via cellular), but it wouldn’t work with her APAP version. Instead, she’ll have to mail the data card off to the DME for review. It seems that compliance monitoring wasn’t as strictly enforced when I received both of my machines. In fact, I don’t think my compliance data was monitored on more than one occasion, if even that much. It’s possible that it was but that I somehow slipped through the cracks though my wife mentioned an “effective date” on the paperwork, so it sounds like a new requirement. What does this mean? Well, it means we won’t be adjusting any of her system’s settings as that can be reflected in the data card and I have no desire to cause problems with the insurance company. However, I am hoping that we’ll still be able to review her results. My opinion on this requirement is two-sided. It will help ensure that individuals who actually use CPAP devices will receive better care and proper adjustments from monitoring. In fact, I might have benefited from such close monitoring during my first few years of CPAP use. However, I also see this as being somewhat of a scam as it requires the patient to use the services of certain healthcare providers, regardless of the results of treatment. If you still want to access/change your settings then you can find instructions for the ResMed S8 AutoSet II and the S8 Elite at the Change CPAP Pressure Settings page on apneaboard.com. Note that these same instructions can be used just to access the Efficiency Data. Not too long ago I decided to purchase a battery that I could use on a camping trip as well as around the house if we lost power. 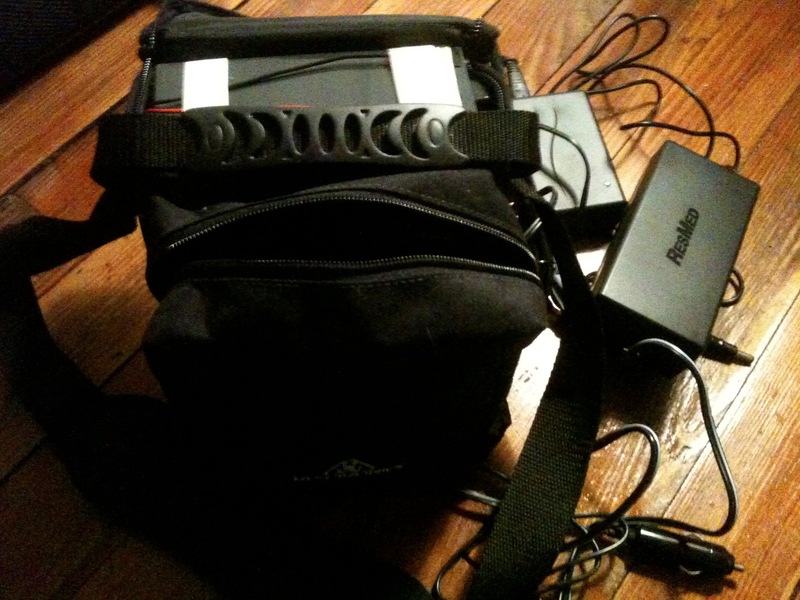 It’s worked great and about once a month I’ll run the CPAP from it for two nights to help keep the battery healthy. Most CPAP batteries cannot also power a humidifier. Mine won’t but it’s very, very rare that I need to use the battery. For a long time I resorted to sleeping on my back, especially after being diagnosed. I also slept on my side but not as much. In fact, I think this may have been the recommended position by my sleep center. However, after additional reading many agree that this is actually one of the worst positions for someone with obstructive sleep apnea to sleep in. It can cause tissues to more easily close in the throat. One post I read suggested that it’s commonly used in sleep studies because it’s more likely to bring forth sleep apnea symptoms. Many of the posts I’ve read recently recommend sleeping on one’s side. I now agree with this opinion. I’ve found more consecutive, restful nights have occurred when I slept on my side. It’s not without its challenges, though. Without adequate diligence mask leaks are more likely to occur due to compression against the mask from the bed or pillow. Most side-sleepers try to use the edge of the pillow or use a special pillow made to accommodate a CPAP mask. I read a number of posts that suggested using a buckwheat hull pillow, so I went ahead and purchased a small one (Sobakawa Buckwheat Pillow). It does seem to be much easier to position. Since it’s comfortable, and can be shaped to a degree, it’s possible to create an area for the mask to prevent the pillow from putting a lot of force on the mask. Overall I just didn’t find that it made much of a difference for myself and I found it to be slightly uncomfortable. At some point it migrated into my closet and then into our yardsale stuff (nobody but it and I think I tossed it out after the last yardsale). I think it’s important to have a good case to carry the CPAP, mask, and hose in. I was using the soft case that originally came with the device. However, I recently purchased a hard shell carrying case, which means I’ll no longer have to warn others to not place their luggage on top of my CPAP. It’s also a good idea to pack a small extension cord and leave it in the bag. I’ve found that it’s not unusual to be staying with friends, family, or at a hotel and not be able to find a power outlet that the CPAP power cord can reach without an extension cord. In such cases I sometimes find myself having to sleep in a specific spot or on a certain side of the bed just so the machine can reach the power. A while back I started using my humidifier every night so I pulled some more foam out of the case for storing the entire machine, which isn’t shown in these photos. ResMed software and card readers are difficult for patients to acquire – ResMed appears to prefer that only medical professionals have access to the software. Your results may vary depending on the manufacturer of your CPAP and your DME. I was able to order the software and card reader from outside of the US. The software arrived but I’m still waiting on the card reader. Maintenance is important but overall I’ve found two components that must be replaced on a regular basis, which can significantly impact the effectiveness of my treatment. These items are listed in the order in which they make the most difference. Hose Cover: I bought a cover for the CPAP hose, which helps prevent condensation at times (also referred to as “rainout”). This is more of seasonal issue. I find that I need to use the hose cover during the colder part of the year when the heater is required. When it’s warmer and the A/C is running, such as in the spring or summer, I typically do not have a condensation problem so I remove the hose to reduce the hose weight until I need to use it again. Chin Strap: This wasn’t very useful with my full-face masks and I’ve actually found that it creates more problems with my nasal pillow mask. I’m currently sleeping without this. 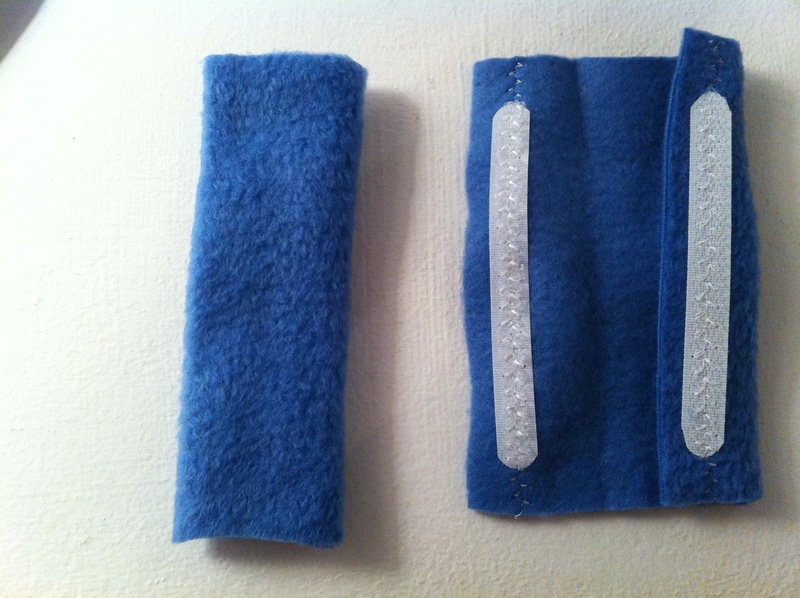 CPAP Pillow: I purchased a pillow made to accommodate a CPAP mask several days before I originally wrote the content in this page. I used it about four nights and I can’t say that I noticed any major difference. 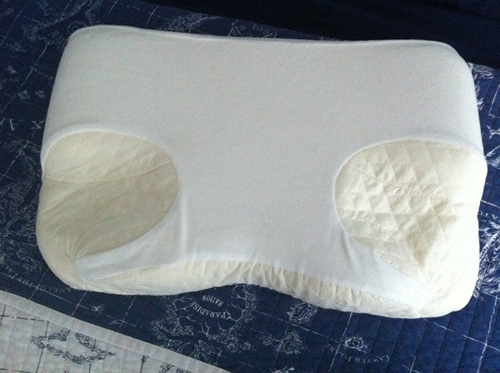 It didhelp relieve pressure between the mask and the pillow but I found my regular pillow to be much more comfortable. Fortunately, I was able to get reimbursed so this experiment wasn’t a complete waste of money. I stopped using it and it’s either in a closet or got tossed out. My wife tried to use it a few times but she didn’t stick with it either. Mask Liners: After several nights of the RemZZZs liners I concluded that they didn’t make enough of a difference to know whether they or not they are an improvement. It is likely that they would extend the life of the mask seal, but I decided to stop using them. I tried them out again a few more times but they didn’t really seem to help me. I think my facial hair is what made them largely ineffective for myself. However, after one night of using one, my wife stated that she had fewer issues with her mask (ResMed Quattro FX). I recently purchased and tested a Pad A Cheek Mask Liner. Unfortunately, it didn’t work for me. In fact, it increased leaks. Again, I think my facial hair was the problem. After deciding it didn’t work for me I went ahead and ordered one for my wife’s mask since she did like the RemZZZs liners. She used it for a while and preferred it over the RemZZZs liners but I think she stopped using it a month after we got it. Hi, is this setup still working for you? I am just now deciding to buckle down and take care of this issue myself, and you seem like you really found a winning setup. If so, I think I might give your methods a try. So far it seems to be working well. I still have a few off nights every now and then but I think that will happen with almost any setup. I cannot tolerate the outrageously high pressures that the sleep study people gave to the doctor and have lowered the pressure myself. It does no good at all if the seal is blasted right off one’s face.